Goodbye Windows, and welcome back Ubuntu my long lost friend. Finally after a year of working with Windows I managed to find some time to get rid of it and install Ubuntu on my work laptop instead. I can’t tell you how much I missed not having apt-get! I am absolutely thrilled to be using Ubuntu again, and with Compiz now a part of Gutsy Gibbon I no longer have OS X envy anymore. Really I don’t, I haven’t touched my eMac in days, mostly due to wasting so much time tweaking Gnome with eye candy that my eyes hurt. Furthermore, I made the switch because developing Ruby on Rails applications on Windows is such a pain, and most developers know this, so they go out and buy Macs. Well my friends, you can save your dosh and turn your stock standard Dell into a kick arse development environment for Rails. Just check out the screenshot of my desktop below. 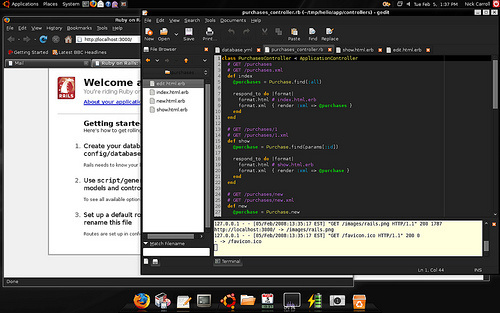 I am using Ubuntu Gutsy Gibbon with Compiz and Emerald. I also have AWN installed for the dock functionality. For Ruby on Rails development I am using a tweaked version of Gedit with plugins that provide much of the functionality of Textmate and more. You can also get Gedit to recognise rhtml files, and provide a real terminal for handy access to command line functionality in the bottom pane. Sadly I have to keep my Windows partition around for Lotus Notes, but for not much longer. The next release of Lotus Notes will provide support for Ubuntu, and is due out around the middle of this year. Only a few more months until I can completely blow away my Windows partition!